Once you've assigned a lesson to the students in your class, they'll be able to access the playlist content and complete tasks associated with the lesson. As they do this, you will be able to track their progress in a number of ways. For the active lesson, the number of students currently working on any given task will update in real time. In the picture above, the lesson has just been assigned and students have not yet begun working on it. Therefore, all 6 students are currently on the "#1 Practice Challenge" task. In the picture below, David has completed the first and second tasks, and is now working on the third task. 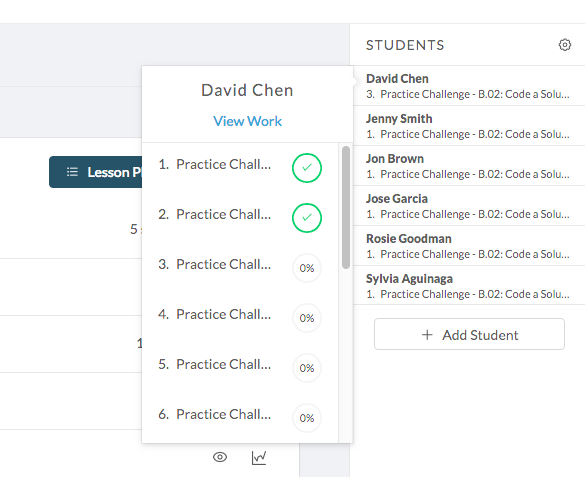 If you hover over the "1 student" on #3 Practice Challenge, you can see that it's David. NOTE: A student may be shown as currently working on a task, but this does not necessarily imply that they've completed the previous tasks. It is possible that they have skipped ahead to that task. This is something to keep in mind when assessing student progress. Clicking on the class progress button for a particular task (i.e. item 2 shown in the first picture above) will bring up a class-level view of progress on that task. In the above image, we have clicked the progress button for #2 Practice Challenge. You can see that, so far, David is the only one in the class who has successfully completed this task. At the top of the list of tasks on the left, you'll see an "All Tasks" section. Clicking here will display a class-level view of progress across the whole lesson. In the above image, you can see that David has completed 14% of the total tasks for this lesson. NOTE: Click the arrow at the top left of the screen to exit class progress view. You can get a sense of how an individual student in your class is progressing through a playlist by clicking on their name in the right sidebar. Doing so will bring up a summary of the tasks they've completed. In the image below, we can see that David has completed the first two tasks in the playlists. Indeed, if we look directly underneath his name in the right sidebar, we can see that he is currently working on the third task in the playlist (while everyone else is still on the first task). Your class is working on the lesson B.02 playlist. You look at your class dashboard and notice that it says "1 student" is on the first bonus challenge while the rest of the class is still far behind. You hover over this "1 student" and Rosie's name pops up. Just to make sure, you look underneath her name in the right sidebar, and you can see that yes, she is currently working on a bonus challenge. You decide to investigate further. 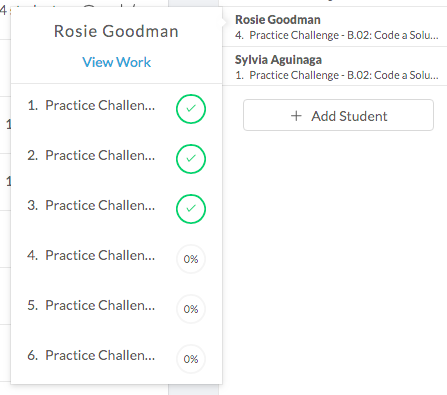 You click on Rosie's name, and notice that she has not actually completed any of the practice challenges, and instead has skipped to the bonus challenges. You walk over to her desk and remind her that it's important to complete the practice challenges before moving on to the bonus. A few minutes later, you check your dashboard again and see that she's now working through the practice challenges.